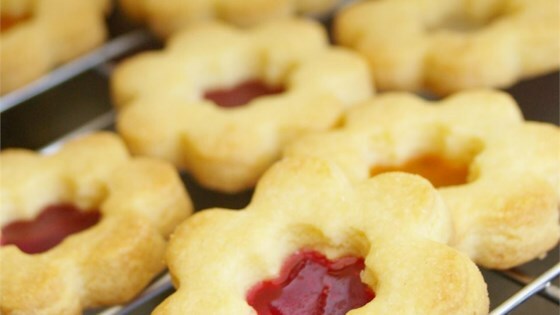 "These are cookies which have open spaces which are filled with crushed hard candy (yellow and red work best). When baked, the candy melts and gives the appearance of "stained glass"." In a large bowl, cream together the butter and sugar. Stir in vanilla and eggs. In another bowl, sift together flour, baking powder and salt; add to egg mixture alternately with milk. On a lightly floured surface, roll the dough 1/4 inch thick. Cut into 1/4 to 1/2 inch wide strips and, on a well-buttered baking sheet, form into window frames. Keeping the colors separate, place candy in plastic bags and crush with a meat mallet. Place crushed candies inside window frames. Bake for six minutes, or until candy is just melted. Cool on baking sheet for 5 minutes, until candy is hard. Carefully lift cookies off baking sheet with spatula. Cookies were good but they stuck fast to the cookie sheet and broke when trying to get them off. I would not make this again. try using hard cinamon candy instead! makes a very nice twist!